I got my Seminar classes! I am so excited! 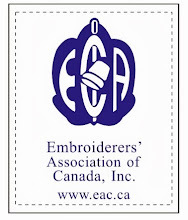 The emails came out today letting everyone who registered for EAC Seminar 2015 in Calgary (Stampeding Stitches) know which ones they got into! So, (drum roll please) here is what I'll be taking! My first two day class will be Cuori e Fiori with Kathryn Drummond! 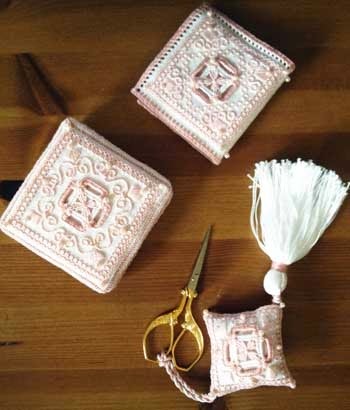 This class is in Punto Antico embroidery, also known as Italian Cutwork, and I'll be making a beautiful set of needlework accessories. I am taking a one day class on the "free day" rather than signing up for a tour since there isn't a lot in Calgary I haven't seen already. I will be taking Midnight Miniature from Hazel Blomkamp. Hazel is the author of "Crewel Twists" and "Crewel Intentions", a wonderful stitcher from South Africa. What an opportunity! 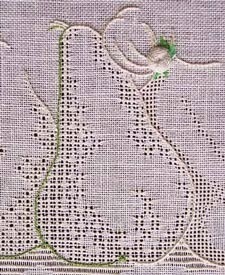 A miniature of the design featured on the cover of Hazel's book, Crewel Twists, this design will teach the joy of using beads in crewel embroidery. It will be worked on black dupioni silk (my fav!) with DMC stranded cotton, metallic threads and Miyuki beads. I can't wait! This one, Resting on Pears, was definitely the class I wanted to get into the most and I made it! Gale Washington is a wonderful teacher and I have taken classes from her before. This is an intermediate class so I will need to brush up on my pulled thread. 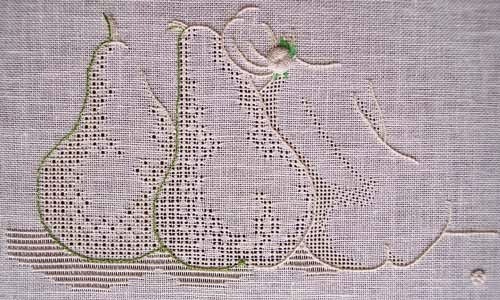 This class will teach shading through the use of value created with pulled thread stitches. Worked on 30 count linen with perle cotton and metallic thread, it should be a real treat! I love the tongue in cheek design of Resting on Pears! If you make it to Calgary in May, there are still some great classes available to register in! Check them out! I have been enjoying working on Diane Scott's canvaswork apple so much the last few days and have completed the first section. I am trying to be disciplined and work on my huge pile of UFOs. At the very least I would like to stop creating a bigger and bigger pile! So, my fun stitching right now (fun being something that doesn't have a looming deadline) is Diane Scott't three dimensional apple. Nothing exciting to see in this photo - still working on the outline. If you haven't seen Diane's beautiful fruit designs though, you should check them out. They are exciting! I'll post my progress on this piece as it moves along. So, I have been writing articles for the last little while, each one focusing on a certain stitch, variations of it, and photos of examples to try to entice readers to give it a try and see what they can do with it. 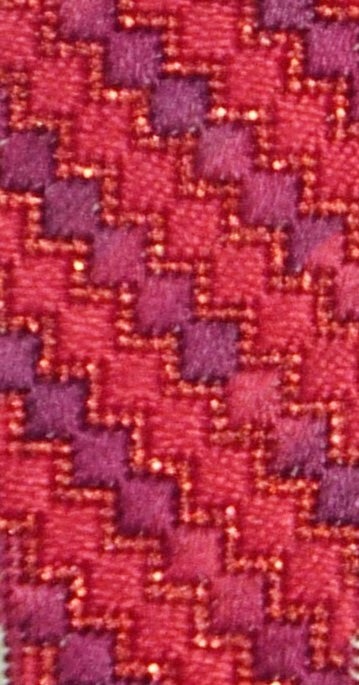 It is sort of a natural continuation of the Build a Seam series here on my blog. What can I say? I love stitches! I want to send out a big thank you to my friends at Crazy Quilting International for allowing me to use photographs of some of their beautiful work. Phyllis Latham shared the incredible little white bird on this page with me. 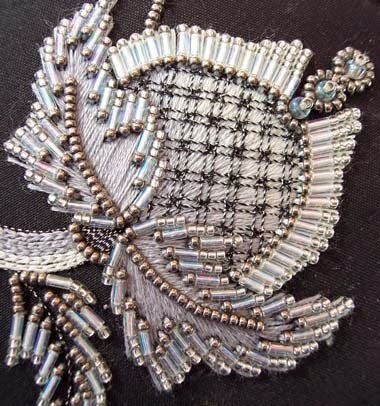 Believe it or not, it is one long bullion stitch with 120 wraps that are then manipulated to create this bird. Phyllis also created the adorable bullion stitch cupcake on this page - too cute! Flora Goodson shared the Christmas tree, the heart and the grasshopper. The grasshopper is another incredible little piece of stitching. The robin and beehive with bees are mine, both inspired by A-Z of Bullions put out by Country Bumpkin. Of course, I had to sneak a crazy quilting block into the article! lol Janet Popish was kind enough to share her creation with me to inspire and delight. The little Christmas pudding at the top is another of mine, once again stitched from A-Z of Bullions. I have to say I am having a lot of fun writing these articles and hope to continue with the series for a little while. My friends at Crazy Quilting International will, I hope, continue helping me out with examples of their work to use so I can show their stitching off to the world! If you haven't tried Bullion Stitch yet - do it! I needed a hands on tutorial from my friend Ilys to get my head around this stitch initially (thank you Ilys!) but once you get the hang of it there is virtually nothing you can't do with it. Bullion Stitch is definitely one of the most versatile and creative stitch in our box of stitching tools! I did a guest post for the Embroiderers' Association of Canada blog last week with lots of photos of a crazy quilting round robin I was in some time ago at Crazy Quilting International. It was an Under the Sea theme - one of my favourites so lots of great eye candy. Here is one of the blocks so you can get the idea. 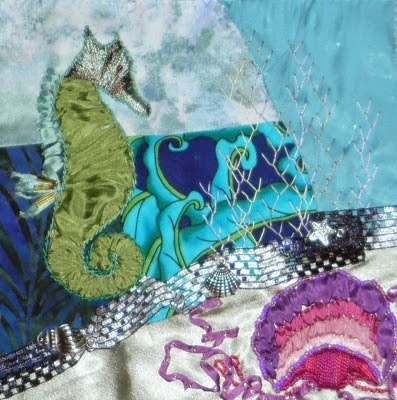 This is the DYOB block I embellished for Nicki Lee - lots of fun with the silk ribbon embroidery seahorse. Along with the eye candy, there is a giveaway on the guest post I did. You can head over to my post on the EAC blog and leave a comment to be entered to win a copy of Crazy Patchwork by Janet Haigh - a great book! You have until February 1st to enter so run right over and leave a comment - good luck! 1. Stitch 15 minutes a day. 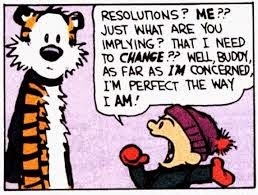 I make this resolution every year and it is the best one because it works! If you stitch for 15 minutes every day at the very least you will stitch 1-3/4 hours a week. Really though, if you start stitching you are likely to stitch longer. The other problem this resolves is if you don't stitch today, you are more likely not to stitch tomorrow, and so on and so on. Try it - it works! 2, Enter Competitions. I am not putting a number on this because it depends how many I find. I am talking of stitch related competitions of course. 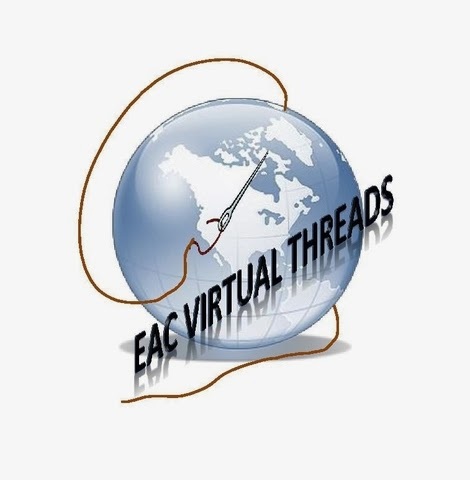 For example, right now on Virtual Threads we are having a little competition to design a logo for EAC Seminar 2018, which our chapter is hosting. 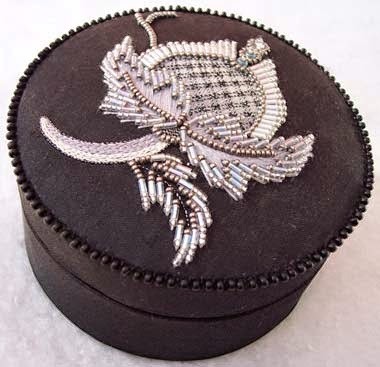 Piecework has a competition each year - this time it is a pincushion. That should be fun and I have ideas bubbling already on what I would like to do. Nordic Needles and Quilting Arts have challenges on a pretty regular basis and of course, The Calgary Exhibition and Stampede has their needlework exhibition each year. Not planning on winning any of them - the resolution is to enter which takes a bit of creative thinking and some organization and following through to completion - all things I could use some practice on! I'll be back with some more soon. Have you made any? Let me know and we can cheer each other on! Renovations - I hate them! What does this have to do with stitching? Not much, but it has a lot to do with why I am not getting any done! We are a one washroom household and with the recent influx of returning kids and grandkids there are between five and seven people living here at any given time. So, if you are a man, i.e. my husband, this would seem to you to be the best time to rip apart the washroom and start renovating, right? Right. Couldn't bring myself to buy into the whole grey for walls thing, so we settled on a beige and darker beige that will be harmonious with the colour of the new tile. I did a lot of the painting - kept finding little love notes next to my coffee cup in the morning - "While I am at work, would you mind painting the...?" The wainscotting was painted the darker beige. After I got the first coat on, husband and son (double man-think) declared it too light a shade but admitted that a second coat might improve it. Now we get to "woman-think" - mine. If they want it darker, whack the paint on there good and thick. Hmmm.... then the topic of "runs and drips" came up in conversation. Now, realistically, this wainscotting is something we created from the original hardwood wall boards we recovered when we started the renovation of our old church 20+ years ago. Which makes these boards approximately 120 years old - IF they were new when they used them and not donated from somewhere else. They are OLD. Does a drip or two really seem out of place? To me it would seem to add a bit of shabby chic charm. The men's jaws drop at this outrageous lack of logic. Two pairs of eyes try to bore holes in my head to place their own logic there. Daughter-in-law and grandson suddenly find urgent errands elsewhere. My heels dig in. Hard. My husband has declared he will redesign my huge linen closet in the washroom - create many shelves, doors, drawers, etc. "so I can finally manage to keep it organized". He's doing to keep me organized - oh, joy! So, I spent most of today painting the inside of the closet as it is now so he will no longer want to redesign it for me. Lying on the floor with my head inside the closet painting the bottom side of the lowest shelf, I was delighted to see on the last paint job he had cheaped out and not painted there. Now, that proves women are superior right? Yes. In the meantime, all this has been going on for two weeks now. Tiles are still in their boxes but other things have moved. My sink is standing out in the hallway. The bathtub is balanced precariously on little bits and pieces of tile. The only truly functional thing in there is the toilet and only because I insisted that it was not optional during the renovation. First UFO of the year finished! Well, it is a good thing I have not posted my goals or resolutions for this year yet because I would be off to a very bad start doing my first blog post of the year on January 13th! I have been keeping busy though and finished my first UFO left over from previous uears. The idea for this journal cover came from a random piece of Ukrainian embroidery I picked up at the thrift store. At least I think it is Ukrainian, correct me if I'm wrong please. Anyway, it is just too lovely not to make use of and the size lent itself to almost covering a daily journal. Since it wasn't quite wide enough, the green aida was added on one side and I cross stitched my friend Jo's name on it. I guess I let the cat out of the bag here on who is getting this. There are simple flaps folded over and sewn to hold the cover on the journal. The whole thing was stitched by hand as I went along with the book itself for a guide. Fun little project, nice little gift and a bit of upcycling to boot. What more could you ask for?